I think I seldom do anything that's really against the grain in terms of makeup looks, so I just felt like exploring for once. I paired a pale sky blue with a dark smoky eye, for those of you who want a little kick to your usual evening routine. Do note that the liner I used (Lime Crime Uniliner in Blue Milk) ﻿is﻿ quite an expensive option, and I'm not aware of any dupe at this point, so if you want a similar effect on a budget, I recommend a matte baby-blue pencil or using a liner sealant to apply a matte baby-blue pigment or shadow as a liner. 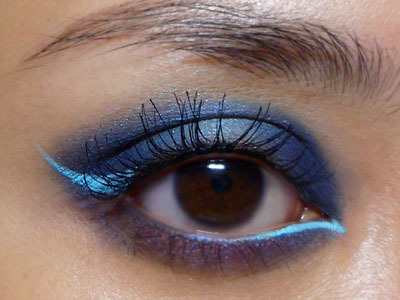 Step 1: Apply a deep, rich metallic blue over your lids, leaving just the center clean. It's best to use a good primer beneath so the pigments will show up really strong and dimensional. Make sure to go under the eyes, alone the lower lash line as well. I used a limited edition MAC Shadow called Motorhead but there are PLENTY of beautiful deep blues around from brands like NYX, etc. Step 2: In the center, pack on a soft pastel blue and gently blend the edges outward into the deeper blue so there are no harsh lines. This should give a really beautiful contoured gleam. Step 3: You can finish off with black mascara and leave it be, or you can do what I did (for a kick) and apply a bright, matte baby blue liquid liner along the inner corners of lower lash line, and as a flick at the outer corners. For the lower lashes, to prevent smudging and smearing or general eye irritation, take care to apply to your tightline (where the lashes go into the flesh) rather than directly in the center of the inner rims. For the flick at the outer corners, as always, follow the angle of your lower lash line. This is the best angle as the flick will work with your natural contours and never look like it is "off". When your eye is open, the lower and upper lines should look beautiful together. I love the effect of the light liner..
Lime Crime Uniliner Swatches and Tips!